Published April 21, 2017 By Anna T. This post may contain affiliate links. Regardless, I only recommend sites I've researched and/or used and trust. A virtual assistant is very much like a “cyber secretary.” You never know what you may be doing and exactly what you do will depend on the client/company you work for. Some things may include customer service, social media, writing, data entry, or even research. If you need more information, this post breaks down what a virtual assistant does. 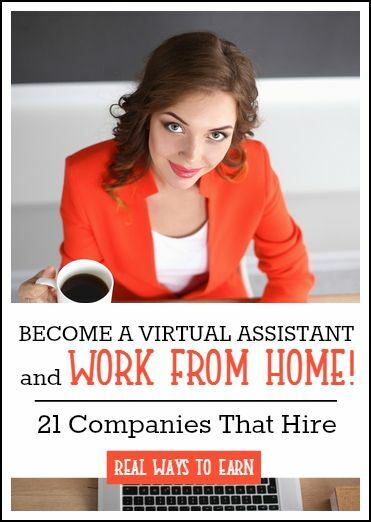 The following is a list of 21 companies that hire remote virtual assistants. Please be advised some of the companies on this list are hiring now, and some do not have openings. If listed, it just means they have had openings in the past, so keep tabs if a company interests you but does not appear to be hiring now. 99 Dollar Social – This company hires remote VA's to update social media accounts for their clients. Pay will vary, but is on average around $12 hourly. Clara Labs – Read Clara Labs Review – Work at home as an email scheduling assistant for Clara Labs. Not always hiring. Position is not always open. Contemporary Virtual Assistance – Read Contemporary VA Review – Occasionally has openings for virtual assistants. You must be available to work during normal business hours. Belay – Read Belay Review – This company prefers you have a bachelor's degree and preferably at least five year's past experience. Equivity – Hires work at home VA's with bachelor's degrees. Only a laptop and smartphone are needed. Fancy Hands – Read Fancy Hands Review – Tasks range from $1 to $5 each to start and go up from there. Firegang – US. A dental marketing company that regularly has a part-time virtual assistant position open. GabbyVille – They hire home-based virtual receptionists. However, the job info is not pasted on their home page. If you are interested in working for them, you can send a cover letter and resume to career@gabbyville.com. Life Bushido – Read Life Bushido Review – $10 per hour. Work between 5 and 20 hours per week. NS Virtual Services – This is a Canadian company occasionally on the lookout for virtual assistants. OkayRelax – Read OkayRelax Review – Must have a bachelor's degree in something to qualify to work at home as a VA for this company. Paragon Planners – Read Paragon Planners Review – Handle scheduling and other tasks for clients in the financial wholesaling industry. Red Butler – Read Red Butler Review – Handle a variety of different virtual tasks for Red Butler's clients. Work 10-30 hours per week. Team Delegate – You can do virtual assisting for this company as an independent contractor. Some of your duties once hired may involve calendar management, arranging travel, creating PowerPoint presentations, and taking meeting minutes. The Admin Center – Based in Idaho and they do require that applicants reside near Boise. They have occasional openings for virtual receptionists. Time Etc. – Read Time, Etc. Review – US and UK only. Pays virtual assistants hourly for their work. The exact rate of pay will vary depending on your prior experience, but the range is $11 to $16 hourly. VA Sumo – Hires remote personal assistants to help clients with a variety of tasks, including writing, transcription, graphic design, social media, and more. Details for applying are in lower right-hand corner of Va Sumo's homepage. Virtual Gal Friday – Has regular openings for work at home virtual assistants. Employee positions, not contract. Vicky Virtual – US only. Work from home as a virtual receptionist for Vicky Virtual. Pays $9.25 hourly. Virtual Office VA Staffing – Real estate calling. No sales, just gathering information. Worldwide 101 – Read Worldwide 101 Review – Hires virtual assistants to work from home. They appear to hire in the UK as well as the US. There is also a FREE Pinterest virtual assistant prep workbook available for those of you who would like to specialize in Pinterest services for your own VA business. If you're looking for more info on working as a VA, other places to get trained, find jobs, etc., the following sites might help. VA Networking – Offers several resources for virtual assistants as well as free training. Virtual Office Temps – Has a job board for VA's and additionally offers basic certification. What Services Can You Offer as a Virtual Assistant? How Much Should a Virtual Assistant Charge For Services? 21 Days to a VA Biz – written by one of our writers, Leisa Good. The Bootstrap VA: The Go-Getter's Guide to Becoming a Virtual Assistant, Getting and Keeping Clients, and More! Post originally published June 2012. Updated and re-published April 2017.